Well, it’ll be different alright. Given the Fed’s actions over the past decade, it can hardly get wrose. President Donald Trump appears ready to remake the Federal Reserve in an image that will be considerably different than what investors have known for many years. The president is prepared to nominate Randal Quarles and Marvin Goodfriend to two of three vacancies at the central bank, according to multiple press accounts that have not been disputed by the administration. Quarles likely would assume the role vacated by Daniel Tarullo to oversee the nation’s banking system. White House officials did not respond to a CNBC request for comment. Should Trump nominate the two men and they receive confirmation, it will represent the first steps in a possible substantial remaking of a Fed that has practiced ultra-loose monetary policy for the past decade but has been tight on banking regulations. U.S. President Donald Trump told his top diplomat that the dispute over probes into links between his inner circle and Russia should not undermine U.S. efforts to rebuild relations with Moscow, Secretary of State Rex Tillerson said on Tuesday. Speaking in New Zealand after a trip to Australia, Tillerson reiterated the U.S. commitment to the Asia-Pacific region as global leaders have expressed growing mistrust over the Trump administration, which has withdrawn from key international agreements since taking office. At home, Trump’s administration has been plagued by questions over links to the Russian government. Tillerson said Trump told him to try to improve ties with Russia regardless of the U.S. political backdrop. “I can’t really comment on any of that because I don’t have any direct knowledge,” Tillerson told a news conference in Wellington, when asked how worried he was that the U.S. political crisis could take down the Trump administration. “The president’s been clear to me: do not let what’s happened over here in the political realm prevent you from the work that you need to do on this relationship and he’s been quite clear with me… that we might make progress. I’m really not involved in any of these other issues,” he said after a meeting with New Zealand Prime Minister Bill English. The U.S. Department of Justice on Monday charged a federal contractor with sending classified material to a news organization that sources identified to Reuters as The Intercept, marking one of the first concrete efforts by the Trump administration to crack down on leaks to the media. Reality Leigh Winner, 25, was charged with removing classified material from a government facility located in Georgia. She was arrested on June 3, the Justice Department said. The charges were announced less than an hour after The Intercept published a top-secret document from the U.S. National Security Agency that described Russian efforts to launch cyber attacks on at least one U.S. voting software supplier and send “spear-phishing” emails, or targeted emails that try to trick a recipient into clicking on a malicious link to steal data, to more than 100 local election officials days before the presidential election last November. While the charges do not name the publication, a U.S. official with knowledge of the case said Winner was charged with leaking the NSA report to The Intercept. A second official confirmed The Intercept document was authentic and did not dispute that the charges against Winner were directly tied to it. The Intercept’s reporting reveals new details behind the conclusion of U.S. intelligence agencies that Russian intelligence services were seeking to infiltrate state voter registration systems as part of a broader effort to interfere in the election, discredit Democratic presidential candidate Hillary Clinton and help then Republican candidate Donald Trump win the election. The new material does not, however, suggest that actual votes were manipulated. … but it gets weirder. Soon after the Intercept published the story and docs, the leaker was arrested. How? She could easily be traced back to these docs. Was the Intercept not aware of this? That’s hard to believe, leaked documents is what they do. Was someone careless? We haven’t seen any excuses made. Did they knowingly give her up? Is this then the end of the Intercept? Today, The Intercept released documents on election tampering from an NSA leaker. Later, the arrest warrant request for an NSA contractor named “Reality Winner” was published, showing how they tracked her down because she had printed out the documents and sent them to The Intercept. 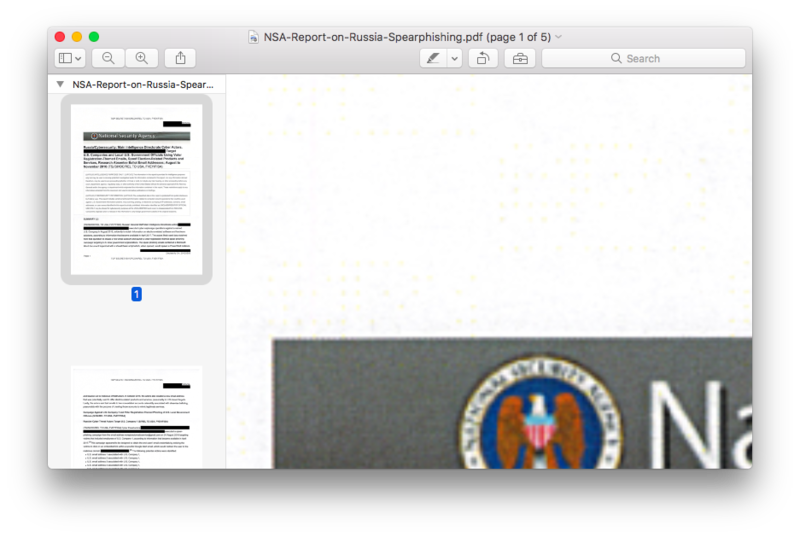 The document posted by the Intercept isn’t the original PDF file, but a PDF containing the pictures of the printed version that was then later scanned in. 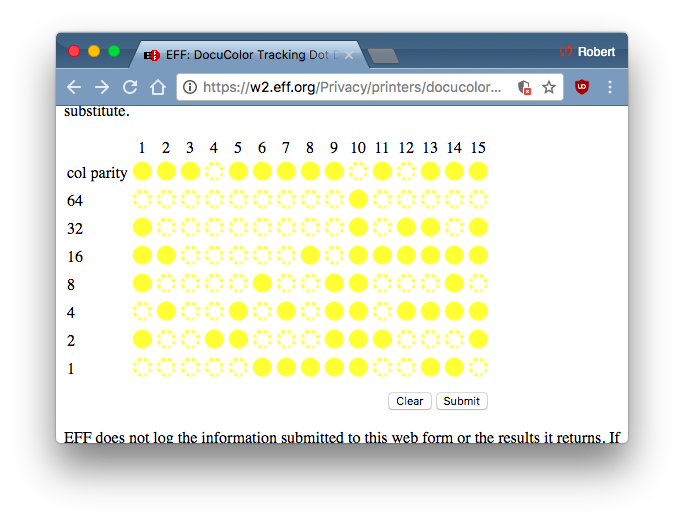 The problem is that most new printers print nearly invisibly yellow dots that track down exactly when and where documents, any document, is printed. 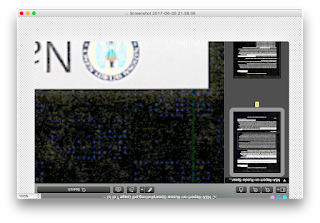 Because the NSA logs all printing jobs on its printers, it can use this to match up precisely who printed the document. In this post, I show how. 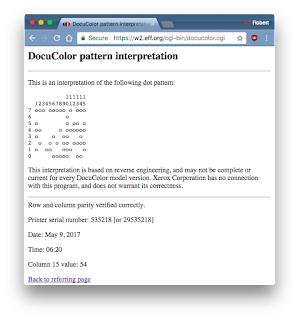 You can download the document from the original article here. 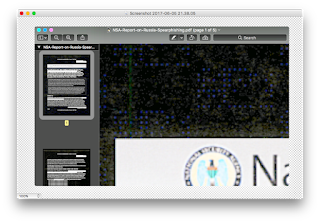 You can then open it in a PDF viewer, such as the normal “Preview” app on macOS. Zoom into some whitespace on the document, and take a screenshot of this. On macOS, hit [Command-Shift-3] to take a screenshot of a window. There are yellow dots in this image, but you can barely see them, especially if your screen is dirty. We need to highlight the yellow dots. Open the screenshot in an image editor, such as the “Paintbrush” program built into macOS. Now use the option to “Invert Colors” in the image, to get something like this. You should see a roughly rectangular pattern checkerboard in the whitespace. High up in a New York City skyscraper, China’s biggest bank is playing in the shadows of American finance. The prize for Industrial & Commercial Bank of China isn’t stocks, bonds or currencies. It’s the grease in the wheels of all those markets: repurchase agreements. By exploiting a loophole in rules intended to keep U.S. banks from getting “too big to fail,” the state-owned ICBC has become a go-to dealer in repos in just a few short years, alongside longtime powerhouses like Goldman Sachs Group Inc. The short-term loans allow investors to borrow money by lending securities, serving a vital role in day-to-day trading on Wall Street. ICBC’s rise reflects not only China’s global ambitions in high finance, but also how post-crisis rules have let a whole host of new players profit from the murky world of shadow banking, largely beyond the reach of bank regulators. As big banks face tougher standards, they’re being replaced by brokers, asset managers and foreign firms like ICBC, which can use more leverage and take greater risks. That has some regulators worried non-bank lenders are once again emerging as a threat to financial stability, less than a decade after panic in the repo market wiped out Lehman Brothers. “The concern is that non-bank dealers are becoming a larger part of the repo market,” said Benjamin Munyan, who specializes in shadow banking and regulation at Vanderbilt University’s Owen Graduate School of Management. “These intermediaries are outside the scope of our traditional Federal Reserve safety net.” In some ways, the development is emblematic of how steps taken to stamp out financial risk-taking in one area have created unforeseen risks in another. But it also highlights the willingness and ability of firms to jump through whatever holes regulators leave or create. In a repo, firms borrow money by putting up securities like Treasuries as collateral. The cash can then be used to buy higher-yielding assets, something hedge funds often do. When the agreement expires, the borrower “repurchases” the collateral, paying interest to the lender. The process can be repeated over and over, boosting a firm’s leverage, as long as the assets backing the repo maintain their value. During the credit crisis, reliance on such short-term funding helped bankrupt Lehman and imperiled the financial system. Bailouts put the biggest securities firms under Fed supervision as banks, and Dodd-Frank regulations forced them to shrink their assets. A key provision has been the enhanced capital requirements, which made it prohibitively expensive for large U.S. banks to warehouse low-yielding Treasuries and finance repos. China runs out of collateral. China is not only one of the world’s largest debtors, it is one of the world’s largest creditors. China uses debt not in the customary financial manner, but as a political tool to generate employment and maintain social stability. Likewise China uses loans and investment as a tool to advance its strategic interests. This may be good geopolitics in the short run, but it will be a disaster economically in the long run. Just as Chinese state owned enterprises (SOEs) can’t repay debts to Chinese banks, China’s foreign partners will not be able to repay debts to China itself. These twin disasters-in-the-making may converge in such a way that China’s assets disappear or become illiquid at exactly the time they are most needed to bail-out its own banking system. China has launched four major overseas investment initiatives in the past ten years. The oldest is their sovereign wealth fund, China Investment Corporation, or CIC, established in 2007. Sovereign wealth funds are a way for countries to invest their reserves in securities other than safe instruments such as U.S. Treasury notes. CIC today has assets of over $800 billion, spread among stocks, corporate bonds, hedge funds, private equity, commodities, and commercial real estate. Some of CIC’s investments are directly-owned enterprises, including gold mines in Zimbabwe. While these assets may outperform Treasury notes over time, they are also illiquid, and would tend to decline in value during a financial panic. This means that about 20%, of China’s reserves are unavailable for critical tasks such as bailing out the banking system or defending the currency. [..] The problem with One Belt, One Road is that many of the potential recipients of development loans are not highly creditworthy or have a track record of defaulting on debts or requiring substantial debt restructuring in order to stay current. As with Chinese bank loans to SOEs, the NDB, AIIB, and One Belt, One Road efforts are not primarily economic but political. China is seeking to use its economic clout to create jobs and control critical infrastructure. [..] As with its other policies, China will turn liquid assets into illiquid assets in order to pursue its ambitions. This could make sense if nothing goes wrong. But, things will go wrong. China will face a monumental liquidity crisis sooner than later and find that its liquid assets have been turned into bridges to nowhere. This thing has been developing over decades. Qatar’s stock market tumbled more than 7% on Monday as six of the Middle Eastern country’s neighbors reportedly severed diplomatic relations with Doha for allegedly supporting terrorism. The key stock index in Doha slipped shortly after Monday’s open – the benchmark’s sharpest fall in more than seven years – before paring some its losses to trade down 7.2% at around 3:00 p.m. local time. Six countries, including Saudi Arabia and Egypt, had all coordinated on Monday to accuse the wealthy Gulf state of supporting terrorism, which Qatar has denied. Investors viewed the diplomatic withdrawal as a major breakdown between powerful Gulf nations, who are also close U.S. allies. While Saudi Arabia – the world’s leading crude oil exporter – said Qatar had supported “Iranian-backed terrorist groups,” Qatar described the joint decision as having “no basis in fact” and was therefore “unjustified”. Political tensions in the region had been building in recent weeks as Egypt, Saudi Arabia, Bahrain and the United Arab Emirates – all countries to have cut relations with Doha on Monday – had blocked Qatari-based news sites in May. However, Monday’s decision was reported to be based on Qatar’s alleged role in supporting Islamist groups and its stance concerning Iran – a regional rival to Saudi Arabia. Qatar, a member of the U.S. coalition against the so-called Islamic State, has frequently and consistently rejected accusations from Iraq’s Shia leaders that it has provided financial backing to ISIS. “Whilst Qatar is the member of the U.S. coalition against IS, wealthy individuals have reportedly made donations to extremist groups and the government is also accused of supporting extremists – allegations that Qatar vehemently deny,” Tamas Varga, oil associates analyst at PVM, said in an email on Monday. If I remember, the UK gets 90% of its LNG from Qatar. Oil markets seem impervious to geopolitical risk. As four Arab neighbors imposed an unprecedented embargo on Qatar on Monday, oil prices briefly jumped 1.6 percent before falling back. The fuel to watch, though, is not oil, but gas. If this dispute is not resolved quickly, it may mean a hot summer in the Gulf. The problem has been simmering for a long time, with three of Qatar’s Gulf Cooperation Council colleagues blaming it for backing Islamist groups including the Muslim Brotherhood, and being too friendly with Iran. But in a dramatic escalation shortly after U.S. President Donald Trump’s visit to Saudi Arabia, the United Arab Emirates and Bahrain, along with Egypt, the shaky official government of Yemen and Libya’s contested eastern government broke relations with Doha and imposed a ban on air, land and sea travel. Much of Qatar’s food and key equipment comes by land from Saudi Arabia, or reshipments through Dubai’s Jebel Ali port. Qatar is one of the smallest oil producers in OPEC, at 618,000 barrels per day, but condensate (light oil) and natural gas liquids – byproducts of its giant North Field – add about another 1.3 million barrels per day. It will stay in the OPEC production cuts deal, and even if it does not, its contribution is small. Its real power comes from being the world’s largest liquefied natural gas exporter. Qatar’s liquefied natural gas and oil exports should not be affected, even if Saudi and Emirati waters are barred to its ships. They can sail via Iranian waters and then pass the Strait of Hormuz via the usual shipping lane in Omani territory, or stay in the Iranian sector if Oman joins its GCC colleagues in the blockade. Any attempt to stop Qatari exports would be a major crisis, and would invite a serious response from major LNG customers Japan, South Korea, China and India. So is Britain’s political model. Mayism could mean Brexit Britain renaming itself Poundland – cheap goods and cheap workers – or it might mean a reversion to some kind of one-nation Toryism. Her party just doesn’t know. Were it not for the Tories’ slim majority, their crisis would be far more exposed. The sofa class don’t do political economy, more’s the pity, but if they did they’d see the contradictions of Conservatism in 2017. The party of capital is now pursuing a policy – hard Brexit – hated by capital. The political arm of the City is about to rip a hole through the City. All these paradoxes are given almost physical representation on our tellies every night by May herself – a populist who doesn’t actually like people. As a non-believer in New Labour, Corbyn has no such ideological awkwardness, while John McDonnell is one of the few people in the Labour party who didn’t subcontract out their economic thinking to Brown and Ed Balls. But still, their team admit they have a way to go in rethinking Britain’s economy – and they are having to do so against a famously hostile parliamentary party. The result is Corbyn’s manifesto, which is chiefly remarkable for its unabashed defence of basic social democratic values. It’s the programme you imagine Brown would like to have delivered – if only he hadn’t been so busy triangulating. But behind the scenes, the party is doing much deeper thinking. I have seen an internal Labour report commissioned by McDonnell. It forms one part of what could be a far more radical programme after Thursday night. Some of the lines in it will give the Daily Mail stories for days – such as calling for a overhaul of the BBC trust (which is “dominated by appointees from the corporate and financial sectors”) and hundreds of millions in public money to be spent on establishing workers co-ops. For the sympathetic reader, however, it contains some of the most imaginative thinking around economic democracy to come out of the party in decades (not saying much, sadly). In that, it sits alongside the speeches made by Corbyn’s team last week about the need for “industrial patriotism”, and to give public backing to new sectors. More cuts are being prepared. Police numbers, including the number of armed police officers, have fallen sharply under Theresa May’s watch first as home secretary between 2010 and 2016 and then as prime minister. The simple numbers tell the story. In 2010 May as home secretary made the mistake that Margaret Thatcher never made in the 1980s and agreed to a Treasury demand to cut police budgets by 18%. Over the next five years the number of police officers in England and Wales fell from a peak of 144,353 in 2009 to 122,859 in 2016. At the same time the number of specialist armed police officers has fallen from a peak of 6,796 in 2010 to 5,639 in 2016. As the graph shows it would appear to be an open and shut case that cuts in police officer numbers have had an impact on the capacity of the police to respond. May was told in 2010 that in cutting police funding she was making a mistake that Thatcher never made when she instinctively realised that there would come a crucial moment when the country, and her premiership, would depend entirely on the resilience of the thin blue line. May took a different approach as home secretary that was not without foundation. She argued that with the big continuing falls in crime that had been seen since the mid-1990s it was not necessary to maintain such a large police force. Anyway, it was argued, there was no direct link between the number of officers and the level of crime. What you get after years of having zero price discovery. It gets worse as we go along. As I have discussed previously, the operating and reported earnings per share are heavily manipulated by accounting gimmicks, share buybacks, and cost suppression. To wit: “The tricks are well-known: A difficult quarter can be made easier by releasing reserves set aside for a rainy day or recognizing revenues before sales are made, while a good quarter is often the time to hide a big ‘restructuring charge’ that would otherwise stand out like a sore thumb. What is more surprising though is CFOs’ belief that these practices leave a significant mark on companies’ reported profits and losses. When asked about the magnitude of the earnings misrepresentation, the study’s respondents said it was around 10% of earnings per share.“ However, if we analyze corporate profits (adjusted for taxes and inventory valuations) we find a very different story. Since the lows following the financial crisis, the S&P 500 has grown by 266% versus corporate profit growth of just 98%. Important Note: The profits generated by the Federal Reserve’s balance sheet are included in the corporate profits discussed here. As shown below, actual corporate profitability is weaker if you extract the Fed’s profits from the analysis. As a comparison, in the first quarter of 2017, Apple reported a net income of just over $17 billion for the quarter. The Fed reported a $109 billion profit. With corporate profits still at the same level as they were in 2011, there is little argument the market has gotten a bit ahead of itself. Sure, this time could be different, but it usually isn’t. The detachment of the stock market from underlying profitability suggests the reward for investors is grossly outweighed by the risk. But, as has always been the case, the markets can certainly seem to “remain irrational longer than logic would predict.” This was something Jeremy Grantham once noted: “Profit margins are probably the most mean-reverting series in finance, and if profit margins do not mean-revert, then something has gone badly wrong with capitalism. If high profits do not attract competition, there is something wrong with the system, and it is not functioning properly.” Grantham is correct. As shown, when we look at inflation-adjusted profit margins as a percentage of inflation-adjusted GDP we see a clear process of mean reverting activity over time. Of course, those mean reverting events are always coupled with a recession, crisis, or stock market crash. More importantly, corporate profit margins have physical constraints. Out of each dollar of revenue created there are costs such as infrastructure, R&D, wages, etc. Currently, one of the biggest beneficiaries to expanding profit margins has been the suppression of employment, wage growth, and artificially suppressed interest rates which have significantly lowered borrowing costs. Should either of the issues change in the future, the impact to profit margins will likely be significant. The chart below shows the ratio overlaid against the S&P 500 index. Well, if you don’t know what something’s worth, how are you going to justify purchasing it? At some point that stops. This year through June 5, 7,561 deals were announced, the lowest count since 2013, according to S&P Global Market Intelligence. M&A volume reached a record $2.055 trillion that year, the firm’s data show, slipping in 2016 to $1.7 trillion. More dealmaking signals, in part, that companies are placing big bets on the long-term growth of certain pockets of the market. Levkovich said tough antitrust measures from European authorities and the Department of Justice antitrust division may be slowing dealmaking. IMF Managing Director Christine Lagarde has offered Greece’s European creditors a way out of their impasse over Athens’s debts that would allow the eurozone to release a tranche of aid later this month. The IMF believes Greece needs a debt haircut, which Germany rejects. Lagarde suggested agreeing a deal whereby the IMF would stay on board in the bailout, as Berlin wants, but not pay out further aid until debt relief measures are clarified. “There can therefore be a program in which the disbursement only takes place when the debt measures have been clearly outlined by the creditors,” she told Handelsblatt in pre-released comments to run in its Tuesday edition. The compromise could allow eurozone finance ministers to give the go-ahead for their next payment of their tranche of aid at their meeting on June 15, Handelsblatt said. “It is a possibility for an agreement,” Lagarde said. Greece has about €7 billion of debt maturing in July, a sum it will not be able to repay unless it gets new loans out of its current bailout worth up to 86 billion euros, the third aid program since its debt crisis began. Eurozone finance ministers failed to agree with the IMF last month on debt relief terms for Greece. They did not release new loans to Athens but recognized it had made significant progress with reforms. Greece hopes that eurozone finance ministers will offer enough clarity in June on debt relief measures that could be carried out after its bailout ends in 2018, to show investors that its debt – now at 197% of GDP – will be sustainable and help it return to bond markets as early as this summer. Trust in the Troika has proven to be a very expensive mistake. The European Commission presented its proposal for possible ways to deepen Europe’s Economic and Monetary Union a few days ago, as part of the public debate on the EU’s future. It went unnoticed in Greece, which is a pity, because if all that is proposed is adopted, the Greek problem will be overcome; also, if the mechanisms and procedures now in place had existed from the start, our country would not have hit a dead end. The question now is how Greece will be part of a system that was established because of the Greek crisis but from which our country is still excluded. The indirect references to Greece are clear. This is where the euro’s weaknesses first appeared, this is where the political center was torn apart and fringe groups gained power, this is where confidence in the common currency and in solidarity is being tested. The Commission’s proposals focus on completing a genuine financial union, achieving a more integrated economic and fiscal union, on greater democratic accountability and strengthening euro-area institutions (including a full-time Eurogroup chair and a European Monetary Fund). The Commission noted the euro’s successes, adding, “And yet it is only 25 years since the Treaty of Maastricht paved the way for the single currency and only 15 years since the first coin was used.” So we ask: As the currency is so new, and as the necessary mechanisms and procedures are only now being instituted, why is Greece continually an outcast? How can we pretend all is well with the euro? . Nice thing is the City Plaza is not really occupied, nor a squat. The former employees own everyhting inside the building. It is almost summer in Europe. Temperatures are rising, and many are preparing for vacations somewhere in the Mediterranean, which means searching for accommodation online. “No pool, no minibar, no room service, and nonetheless: the best hotel in Europe” reads the City Plaza Hotel’s homepage. A joke? Yes. A lie? Not at all. While this hotel in Athens, Greece might not offer those conventional services, it provides something far better: Free housing, medical care and meals for hundreds of people who have had to flee their countries. [..] Over the course of the year, the hotel has provided decent housing for over 1,500 refugees — 400 at any one time — in times of undignified detention camps. It is a model of self-organization and solidarity with refugees — who share living quarters with locals — in times of rising racism and nationalism. [..] Thousands of homeless refugees are living in the streets of Athens, including families with small children. In response to this crisis, the Greek state set up more than 49 detention centers and camps. Activists and refugees had another idea of how to respond. On April 22, 2016 they took over the City Plaza — which, like many businesses since the economic collapse, had been abandoned for six years. Along with eight other self-organized shelters occupied by refugees and activists around the city, the hotel offers displaced people a safe and dignified alternative to the miserable, unhygienic and cruel conditions of the detention facilities. When the City Plaza went bankrupt in 2010, the management failed to pay the employees their final salaries. According to a court ruling, since they were unable to pay the workers monetarily, everything that is inside the building belongs to the workers. However, the owner prevented auctioning the hotel for years. When the seven-story building was finally occupied last year, the former hotel employees declared that they were happy to offer and share everything. And the activists running City Plaza now support the workers and are planning common efforts to meet the demands of both the former workers and the refugees. The refugees’ demands include access to housing, education and employment. By providing everything that is needed themselves, the project proves that decent living conditions for everyone is possible, even in a country as burdened by crisis as Greece. And the warm reception that the refugees have received by those living near the hotel demonstrate that poverty is not an obstacle to welcoming people with open arms. “The neighbors bring some clothes, some food — you know, they are warm. Although their lives are also ruined, they see in the ruins of their lives, the ruins of the lives of other people,” said Maria, one of the Greek activists running the hotel. This topic contains 1 reply, has 2 voices, and was last updated by Mr. Jones 1 year, 10 months ago. Soon after the leaks, the leaker was arrested because she allegedly emailed the Intercept from her work terminal!!! Also, only 6 people accessed the report from her location and she apparently gave herself up and spilled the beans to the FBI when they knocked on her door!! Was the Intercept careless? Yes. But so was the leaker. It appears she didn’t care about getting caught. Anyways, this is all beside the big story itself: Further smoke added to the Russian election sabotage story.